An ancient Egyptian mummified hawk. Minutes before, the hawk had twisted and struggled in the embalmer's hands. Now it lies still—dead—on the his table, covered in the hot, thick resin that had suffocated it. The piney, cedar odor of the cooling resin fills the room as the embalmer carefully lays strips of linen over the body, following the intricate pattern of wrapping that will ensure the preservation of the hawk in this world and beyond. 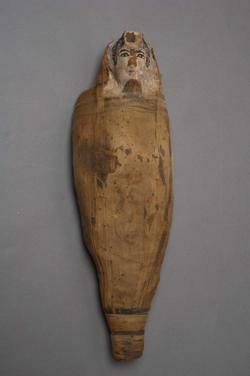 To look inside this mummy, click to the next page!